Born: 30th November 1892, St. Stephen’s, Ipswich. Baptised: 25th December 1892, St. Stephen’s, Ipswich. 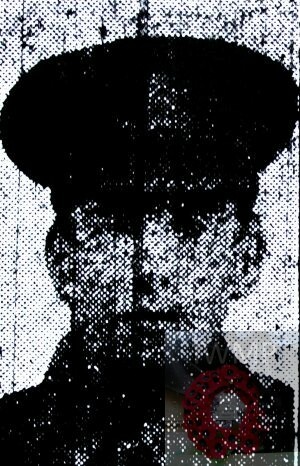 Died: 23rd October 1917; age 24; Died of Wounds – Gas Poisoning – St. Bartholomew’s Hospital. Residence: 11, Little Wingfield Street, Ipswich. Regiment: Royal Field Artillery, 57th Divisional Ammunition Column. Relatives Notified & Address: Son of Walter Coates, of 11, Little Wingfield Street, Ipswich; husband of Agnes Hannah Coppin (formerly Coates), of 16, Coniston Square, Nacton Road, Ipswich. Brother to ARTHUR CHARLES COATES. 1901 11, Little Wingfield Street, Ipswich. Frederick was 10 years old and living with his widowed father & siblings. Walter Coates, 46, a Coachman – Brewer, born Wherstead, Suffolk. William Coates, 19, a Grocer’s Warehouseman, born Ipswich. Walter Coates, 18, an Ironmonger’s Porter, born Ipswich. Elizabeth Margaret Coates, 16, the Housekeeper – at home, born Ipswich. Ethel Mabel Coates, 15, a Tailoress, born Ipswich. Arthur Charles Coates, 13, born St. Stephen’s, Ipswich. George Herbert Coates, 12, born Ipswich. 1911 11, Little Wingfield Street, Ipswich. Frederick was 19 years old, a Porter – Fish & Son – Drapery Shop. He was living father & siblings. Walter, 57, a Grocer Catchpole – Grocery – employer. Arthur, 22, a Porter – Smith’s Suitall Son – General Stationery. Florence, 16, the Housekeeper – at home. Frederick’s mother was Margaret Georgina Coates (nee Kemp), born 1857, St. James, Westminster – died 1895, Ipswich. Ernest John Coates, born September 1917, Ipswich.